Great interview by Mark of one of my favorite thinkers. Where Do You Go For Breaking News? I am not calling this fun friday as I normally do, because what is going on in Boston right now is dead serious. I am hanging out on Twitter, following a few people who are tweeting out the latest news coming out of Boston. The folks listening to the police scanner and tweeting it out are particularly good to follow. I am also browsing around the web to other places like Reddit and Hacker News where people are discussing the news as it unfolds. It makes me wonder what everyone else does when big news is happening. Does anyone watch TV anymore? Does anyone use the traditional media sites like NY Times, Boston Globe, NBC, etc? 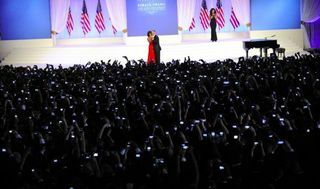 At any major event, people are going to have their smartphones out capturing the moment. They might be taking photos and posting them to social media, they might be taking videos and doing the same thing. Or the images and videos might just stay on their phones. Who knows whether all this crowdsourced footage will prove to be useful to law enforcement professionals in the marathon bombing case. But the mere fact that footage from spectators smartphones has been collected points to its potential value. It is also true that communities like Reddit and 4chan are attempting to do this work themselves. Maybe they will source some interesting images that the investigators can use. Maybe not. I don't get too upset about the potential for vigilantism here as I am not sure how they would all rise up and take justice into their own hands. The rise of computers that we all carry with us everywhere, and their ability to capture what is going on around them, time stamp it, and geotag it, creates a ton of interesting opportunities. Including law enforcement opportunities. And I think that is a good thing. I have written about Bluetooth before. I am very bullish on Bluetooth even though its an old protocol that has its challenges. It may not be as potent as Airplay and DLNA but I feel like its ubiquity and familiarity make up for some of that. I use Bluetooth every day to stream music from my phone to my home entertainment system and my car entertainment system. It works great for that. And last week, I installed a Bluetooth wireless webcam in the Gotham Gal's office. I was concerned about video quality and latency. And they are both issues, but she using the webcam on her conference table to skype and hangout and it works fine for that. It's actually really cool to think about the power of a webcam without wires. I can imagine a lot of applications for that sort of thing. And I am seeing more entepreneurs walking into our office these days with new smart uses of Bluetooth technology than ever before. It's the power of a standard at work. It is evolving and being adopted for more and more uses. Which in and of itself makes it stronger and more useful. I don't have a lot to say about what happened in Boston yesterday. But I do want to acknowledge it. I agree that we should keep calm and carry on. After 9/11, the Gotham Gal made our family get on the subway, go out and about, and not let terror impact our way of life. That was the right call for our family. But before I carry on, I want to make sure that I, and all of you, have the opportunity to talk about the senseless losses and violence that occurred. It is tragic and terrible. 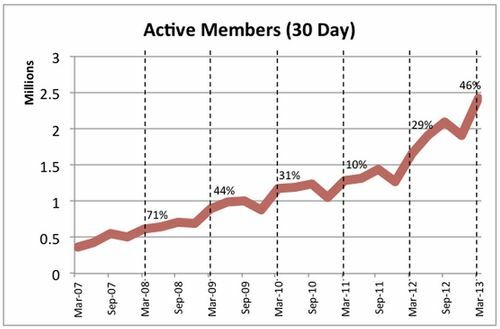 Continuing the theme of case studies for MBA Mondays, I want to use a milestone that was passed last night to make a bigger point about startups. I have known Scott Heiferman since the late 90s. He was one of the early NYC web 1.0 entrepreneurs. We were quite friendly with Scott but we were not early investors in Meetup, the company Scott started right after 9/11. Scott and I were at an event together and when asked about something he replied that he viewed Meetup as "a twenty year project." He said that it would take at least twenty years for Meetup to achieve all that he wanted from it and possibly a lot longer. And that he was patient and committed to that timeline. As we left the event, I turned to my partner Brad and said "we should invest in Meetup, Scott is the kind of entrepreneur that we like and respect." And eventually we did invest in Meetup and we have been investors in Meetup for almost six years now. Meetup is in its second decade as a company and growing rapidly. Last night Meetup booked its hundred millionth RSVP. You can see the counter at the top of this page. That is one hundred million people who used the Internet to get off the Internet and go out and meet other people and talk about things they are passionate about. Now I realize that some of these hundred million people are the same people doing this again and again. But even so, a hundred million RSVPs is a big deal for a company that has been plugging away on this mission for more than a decade. Scott and his team are as passionate about the Meetup mission as they were when they started the company. They have a very long timeframe in their minds and they are executing against it. And they are winning with tenacity and persistence. Which is why we backed Meetup in the first place. Well done Meetup. We've been running the Good Things Come To Those Who Code campaign here on AVC for two weeks. We've raised about $12,000 from about 50 folks. That's a lot of generosity from a relatively small number. So thanks to everyone who has given to date. On September 23rd, here in NYC, we are going to throw a big party to celebrate the 10th anniversary of AVC. I am going to pay for this event and it is going to be open to everyone. It's going to be based on the "Cheers" theme that I've talked about from time to time here at AVC. I am going to tend bar and I hope that many of the AVC regulars can make it. I will share more details of this event as I nail them down. We are going to have VIP passes for this event. Some of you have earned them by virtue of your participation here over the past ten years. But I am not going to announce the VIP list for a while. One way to get on the VIP list is to donate to the Good Things Come To Those Who Code campaign. The folks who have already donated are on the VIP list. If you want to join them, go here and give. If you imagine Twitter not for tweets but for songs, you'll arrive at something like Piki. In Piki parlance, a tweet is a pick. You pick a song and post it to your feed. Here is my piki feed. I have been using Piki in private beta for several months and it's quite good. I am listening to Piki right now as I write this post. Piki is publicly available for iOS and the web app remains in private beta for a few more weeks. Android is next. And sadly, because the music industry makes it this way for developers who choose to work with them, it is only available in the US right now. If you are in the US and have an iPhone, give picking a song a try. You can download Piki here. I've written about convertible debt a few times on this blog, most notably here and here. My general take on convertible debt is that its very good for the founders and not very good for the investors in seed and early stage investments and a much better solution in late stage financings, which I mention at the end of the second linked post. We have a good case study on late stage convertible debt today and I thought we should not miss an opportunity to talk about it. My partner Albert blogged about the $41mm Foursquare financing on the USV blog today. You will note that the investors bought convertible debt. And this is a classic situation where convertible debt was the optimal solution for everyone. In the Foursquare situation, the convertible debt was purchased by a group of insiders led by USV and Andreeesen Horowitz. Both of our firms have been investors in Foursquare for several rounds and both of us own a meaningful stake in the company. Valuation is somewhat immaterial to us as our stake in the company is not going to increase much in this round of financing. But valuation is very material to the Foursquare management team because $41mm of capital is going to be dilutive at any valuation that would make sense here. In Foursquare's specific situation, it makes even more sense because the company has just released an entirely new iOS version which gets iOS to parity with Android and completes the transition toward social search and curation which we all believe better positions the company in the minds of consumers. Also, the revenue model is in its early stages and will be much more developed in the next year. In situations where a valuation inflection point is on the horizon, convertible debt can be an excellent structure for everyone involved. And that is very much the case here.